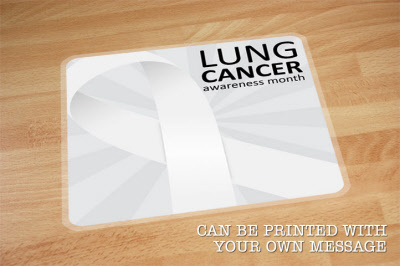 Lung Cancer Awareness floor sticker, with text: 'Lung Cancer Awareness Month'. Can Printed as design shown or custom printed with your own text & logo. Only £21.31 Each When You Order 5 Stickers. Floor Graphic is made from Peelable Non-Slip Vinyl for Short Term Indoor Use (up to 1-month subject to footfall) Minimum Online Order Quantity is 1 Graphic.